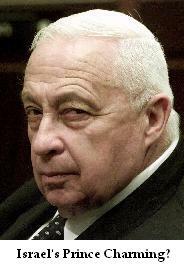 Perhaps sensing the mounting opposition that his proposed withdrawal from Gaza is engendering, Prime Minister Ariel Sharon has launched a concerted effort to improve his image among the Right. In recent weeks, Sharon has reportedly been holding secret meetings with leaders of Jewish communities in Judea, Samaria and Gaza, and he has begun to take certain measures designed to show that he is still a “right-winger” at heart. Today, for example, Sharon told the Knesset Foreign Affairs and Defense Committee that Israel should move ahead with construction of some 3,500 housing units designed to link Jerusalem with the community of Maale Adumim to its east, much to the chagrin of the Palestinians. In the same meeting, he also described Hebron as being a “strategic Jewish asset”, clearly intending to imply that it would remain under Israeli control. To be sure, such statements are a welcome breath of fresh air, if only because they indicate that the Prime Minister has no intention of returning to Israel’s 1967 borders. But it would be a mistake to put too much faith in these remarks, since it is clear that they are designed primarily to pacify public dismay over the unilateral retreat from Gaza. Moreover, talk is cheap, and it costs Sharon nothing to say that he will build, or hopes to build, or would like to build. What counts is what he chooses to do, not what he deems to say. And thus far, he has yet to build much of anything. Likewise, it was not too long ago that he was describing the Gaza Jewish community of Netzarim in much the same terms that he is now using with regard to Hebron – and we all know what happened there. So don’t let the premier’s “charm offensive” fool you – because that is precisely what it is designed to do. It is little more than a verbal distraction from the impending expulsion of thousands of Jews from their homes – and there is nothing even remotely charming about that.